On the left we have Marvel's stationery. An envelope to be precise. On the right is the check itself. (I've blurred out some of the information for security reasons.) Notice anything? The image of Spider-Man in both cases is one from a previous "incarnation," if you will, of Marvel. The envelope sports a "classic" Spider-Man drawn by John Romita Sr. It was used heavily through the 1970s and '80s as the definitive way Spider-Man looked. On the check we see a Todd McFarlane Spider-Man from the 1990s. It was emblematic of the direction the company was taking at the time and, to fans such as myself, still stands for a different Marvel than the one we have today. 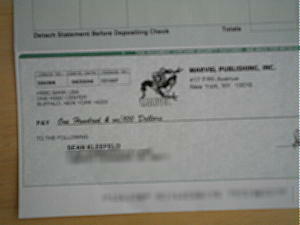 Now, interestingly, the check also sports a Marvel logo underneath Spidey. It's not as clear in the picture (this is why most of my imagry for this blog is taken from other locations) but it's one of Marvel's logos from, again, the 1990s. The lettering is outlined and open at the bottom. I don't think I've seen that in publication use for, what...? Five years, certainly. Maybe ten? My first thought with something like this would be that they just had a TON of these printed up back in the day and are still trying to use them all to clear out some warehouses. 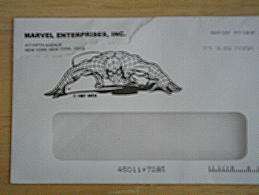 But, if you'll recall, Marvel moved offices a few years ago and both the check and the envelope sport the newer mailing address. Which means that these were printed up within the past couple of years. Now it's a minor point, certainly, and one that doesn't have a significant impact on much of anyone. But for company that is now officially a character licensing corporation, one would think that they would want to ensure that the characters that they themselves are using and are in fact licensing around are used in a manner most reflective of how they would like the characters to be portrayed.